Anis is an educator for the SOS Children’s Villages family strengthening program in Yogyakarta, Indonesia. 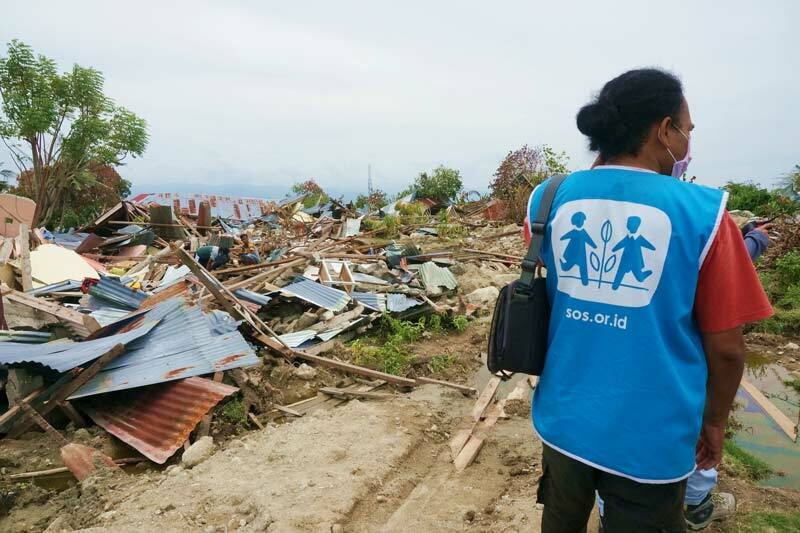 She is among the staff of SOS Children’s Villages Indonesia who have responded to the earthquake and tsunami emergency on the central island of Sulawesi, working with children at Child Friendly Spaces set up after the disaster. The beginning of the monsoon season creates a new urgency to rebuild communities, resume classes and improve the sanitary conditions for those who remain in shelters. In the following Q&A, Anis answers questions about her work and the needs of children in disaster-affected communities. The earthquake and tsunami forced an estimated 80,000 people to seek emergency shelter. What are conditions like at these shelters? The conditions vary at the shelters where we are working. They have enough water now but at some shelters there is an urgent need for improved sanitation and better hygiene facilities. There are also concerns about the safety of some of the surviving buildings. For example, there is a school at one of the shelters that is intact. But the school remains closed because of the unstable seismic conditions in the area. Based on your experience, what are biggest needs of children at the shelters? We have seen cases of trauma and children not wanting to return home because of the fear they experience. But it is not just children who have suffered traumatic experiences. We are also concerned about the families and caregivers who have lived through this disaster. There are families whose houses survived, but they fear going home because of the unstable seismic conditions. They feel they are safer in the shelters. What is SOS Children’s Villages doing to help in cases of trauma? SOS Children’s Villages works with the government and a network of partner organizations in Sulawesi to address the needs of children and their families. We work together in this network and coordinate to ensure that each child’s needs are addressed. We can refer children or caregivers to others in the network, for example, who have psychologists or social workers. What are the main risks for children in this disaster? Hygiene is one of the main concerns. Most of the shelters have water but there are problems – there is a need to improve the cleanliness of public toilets and there are cleanliness problems in some of the living areas. In response to this, we are trying to improve children’s awareness and understanding of the importance of good hygiene. We have lessons about cleanliness, such as how to wash your hands and maintain a clean living environment. There is a high risk that disease can spread in environments like this, and good hygiene practices are vital to prevention. What is especially important about the SOS Children’s Villages emergency response? One of the things we are doing in the Child Friendly Spaces is ensuring there are educational activities. This will help the children in their transition back to formal education. When we do home visits with families, we also share with parents and children the importance of education and going back to class as soon as the schools re-open. Teachers were affected by this disaster too, with many losing their lives, injured or still missing. We are very lucky because we have local teachers who are helping in some of our Child Friendly Spaces. The government is now recruiting new teachers from other parts of Indonesia so the schools can re-open. At this time, junior high schools have re-opened but the primary schools, especially in Palu, are still closed. Is this your first experience working an emergency of this kind? I volunteer for a rehabilitation and reconstruction program in Yogyakarta. I have had training in responding to emergencies. Based on my experiences, I think the government has responded very quickly in Palu. But there are still many children who are in need of support and care, and this need will continue beyond the initial emergency response. Disasters like this can be very traumatizing and have a long-term impact on their well-being. For Canadians wishing to help, donate now to help respond to current and future emergencies through the SOS Mayday Emergency Relief fund.